You are here: Home / Entertainment / Fast romance, honest hearts and Jacquie. 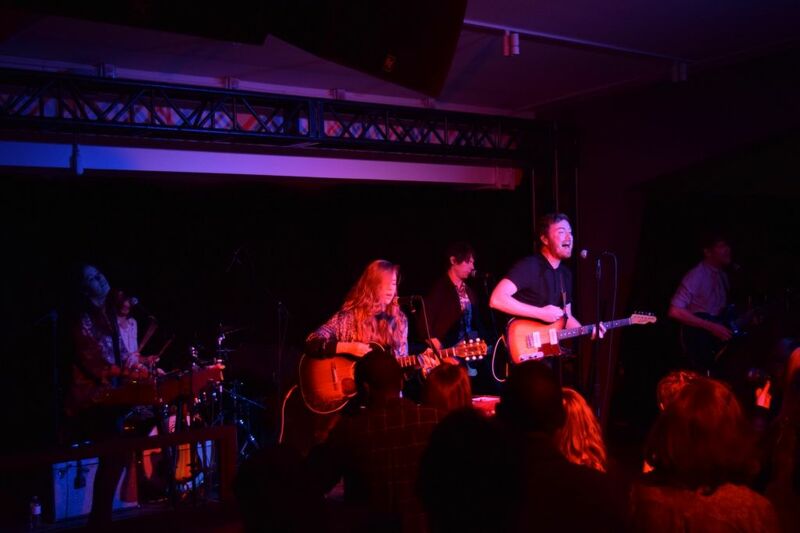 If you missed the Fast Romantics concert in the Observatory Nov. 30, you might have missed one of the best nights of music Algonquin has seen all semester. A key component to any live show is the opening act: you want a performance that will get a crowd warmed up, one that compliments your own sound and won’t overshadow it. In that respect, the Fast Romantics could not have done better than a powerhouse combination of former Balconies lead singer/current Algonquin interior decorating student Jacquie Neville, and Thunderbay, Ont. rock group Honest Heart Collective. When Jacquie Neville took the stage at around 8:30, the crowd was very much in need of “warming up”, leaving nearly three feet of open space between themselves and the stage. Fortunately, Neville managed to lure the crowd in with a mix of sultry blues and potent power-ballads. While Balconies may have disbanded last year, Neville is still working on new music, including her new single Lead The Way which she performed to a very warm crowd reception. The band has two albums under their belt-Liar’s Club in 2015 and this year’s Greif Right’s-and plenty of hits like their current single North American Dream, but everyone loves a good rock cover and their version of The Beatles Helter Skelter was no exception. Finally, it was time for Fast Romantics to take the stage. All six of them. The Fast Romantics has had a few growing pains since it first got its name, with enough current and former members to field a full soccer team. Fortunately, it seems that in its current form the band has found a sum even greater than it’s original parts. Alongside the original members-lead singer Matthew Lewis and bassist Jeffrey Lewis-is drummer Nick McKinlay, guitar and vocalist Kevin Black, keyboardist Lisa Lorenz, and the multi-instrumentalist and sometime trumpet soloist Kirty. The Fast Romantics played a few hits from their previous album American Love, including “This Is Why We Fight” and the SOCAN Songwriting prize winner “Julia”. However, the band had an ulterior motive for this concert. “We thought it would be cool to try out the stuff we’re working on for the next album in front of people first,” lead singer Matthew Angus said. This wasn’t the only surprise the Fast Romantics had in store for the crowd though. Seemingly taking a cue from Honest Heart Collective, the band performed their own cover of Oasis’s Don’t Look Back In Anger. The Fast Romantics play the Rainmaker Brewhouse in Ottawa Dec. 1, and you can check out lead singer Matthew Angus’ interview with the Algonquin Times. Fast romance, honest hearts and Jacquie. Reviewed by Stuart Benson on December 2, 2018 .